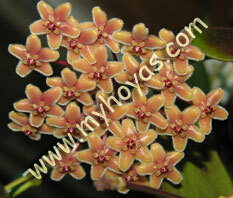 This hoya comes from the Solomon Islands and it was published in 1993. Before it was published this hoya was called Hoya sp. 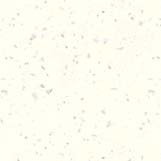 'Mt Gallego' since that's where it's from. This is a hoya that is not the easiest to grow, but rather fast growing and it gets lovely red foliage when grown in full sunshine. When I first got my cutting I thought the seller had sent me a chlorantha var. tutuiliensis, but the seller is very reliable so I didn't worry about it. The leaves are 8-12 cm long, 3-5 cm wide and turn lovely red in the sun. The leaves have very few spots. It's a fuzzy hoya to grow since the leaves tend to curl and become more cup shaped and this can look a bit "ugly" and it also looses leaves very easily. Why that happens, I don't know... maybe it's just here with me that it does that. The flowers are lovely orange, but can be darker if it gets a lot of sun. The corona is lighter with red in the center and each flower is about 2 cm and almost flat. In an umbel there can be 20-30 flowers and sometimes even more. They last more than a week and the fragrance is hard to describe, but in the evenings there has been a sweet somewhat vanilla like fragrance in our dining room.